ODUNDE attracts over 600,000 people annually and is one of the largest community- based street festivals held in the country. The festival, whose concept originates from the Yorba people of Nigeria, West Africa, celebrates the coming of another year for African Americans and Africanized people around the world. It is an occasion highlighted by a colorful procession from 23rd and South Streets to the Schuylkill River where an offering of fruit and flowers is made to Oshun, the Yoruba goddess of the river. ODUNDE is also known for its authentic African marketplace featuring vendors from around the world selling merchandise from many African nations, the Caribbean and Brazil. Each year, the second Sunday in June, ODUNDE, one of the nations oldest African American street festivals take place. ODUNDE will be celebrating its 35rd year in the traditional south Philadelphia location near 23rd and South streets. The festival started in 1975 with a $100.00 grant and neighbors from Fernandez's south Philadelphia community. In two years the ODUNDE Festival exploded. The eclectic mix of vendors, entertainment and music started to draw people from around and beyond the region and each year continues to be no different. Dance, musical and theatrical performances; workshops, lectures and demonstrations featuring African and African American Culture and Folklife traditions. These programs can be targeted to any age group, and offer a wide range of programming from lectures by well-known scholars to African dancers and drummers, storytellers, steppers, doll makers, traditional fashions and hair braiders. A component of Thru African Doors targeted to youth in Kindergarten to High School, which offers African-centered Rites of Transformation programs to schools and social organizations. Cultural excursions and exchange programs, for youth and adults, to key African American historic sites and cultural attractions, in collaboration with The Black Family Reunion Cultural Center. An annual series of local dances which uniquely combine entertainment with history, by providing an opportunity for local residents of all ages to recall the popular African American dances of their youth. "Nigerian artist Yinka Shonibare MBE, today became the first African artist to display artwork in any public space in Great Britain, when he today unveiled his work "Nelson's Ship in a Bottle" in London's Trafalgar Square. The artwork is sponsored by Guaranty Trust Bank of Nigeria who earlier in 2010 registered another first when it sponsored Chris Ofilis collection at Tate Britain, making it the first African corporation to sponsor a major artwork in Great Britain. The Michael Baisden Foundation, founded in 2005 is a (Section 501(c)(3)) non-profit organization that was formed to eliminate illiteracy as well as promote technology and is dedicated to education, support and advancement in our communities. According to MENTOR, three million young people are currently benefiting from the guidance of caring adult mentors and with the combined efforts of the mentoring organizations and campaigns like ours we will help to close the mentoring gap so that the 15 million children who currently need mentors also can benefit from caring mentors. There are currently about 4,600 mentoring programs in the national network of Mentoring Partnerships. The benefits of mentoring is an important tool to help address dropout risk factors and help ensure that young people are supported in their effort to graduate from high school. Youth mentoring is a simple, yet powerful concept. An adult provides guidance, support and encouragement to help a young person achieve success in life. Mentors serve as role models, advocates, friends and advisors. Mentoring offers many options — traditional one-to-one format, team and group mentoring, peer mentoring and online mentoring. These programs are run by community-based organizations, schools, faith-based organizations, government agencies, workplaces, corporations and others. Michael Baisden's own passionate testimony as to how books changed his life gives hope to those who have been enslaved by the shackles of illiteracy. In ten short years, he went from driving subway trains to becoming a four time best selling author, television talk show host, and now, a nationally syndicated radio personality. "Dreams do come true," he says! That dream for me began when I opened a book." In 1993, he began reading self help books and autobiographies. Initially out of boredom, but as time went on, out of curiosity. "I was searching for something," he said. "As it turned out I was searching for Michael Baisden." The book that renewed his interest in reading was The Autobiography of Malcolm X, followed by The Invisible Man, by Ralph Ellison, and Waiting to Exhale, by Terry McMillian, who he admits was his greatest inspiration in writing his first novel. After years of not having read a single book from cover to cover, he was going through as many as three books a week. The fire was lit! And the rest, as they say, is history. "Books do change lives," Michael says, "and I'm living proof!" Born in Vicksburg, Mississippi, Otis moved to Los Angeles when he was 6 years old. His father was a high school dropout who worked as a janitor. The family lived in Watts at the time of the 1965 riots. In the post-Watts period, Otis recalls being stopped and questioned by police several times a year because of the color of his skin. A high school guidance counselor recommended him for a scholarship at Williams College, The highly selective liberal arts institution in Massachusetts. Otis graduated Phi Beta Kappa from Williams and went on to earn a law degree at Stanford. Otis landed on Wall Street as a merger and acquisitions attorney for J.P. Morgan Securities. 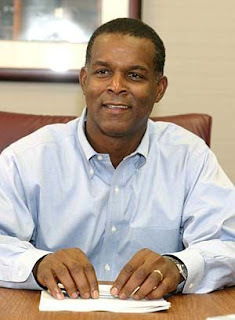 He joinedDarden Restaurants in 1995 as corporate treasurer. He became CEO in 2004.